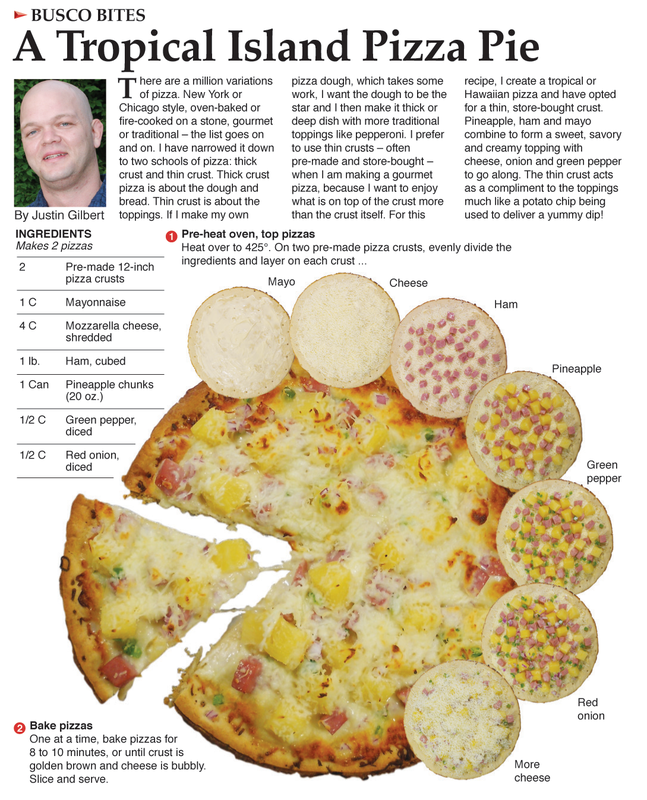 This is the fourth pizza featured in my weekly column. I first made (or heard of, for that matter) Hawaiian pizza at my first place of employment: Tubby's Pizza. I had been working there for awhile and the owners decided to offer more varieties. We had a training meeting and as soon as I saw the owner spreading mayo on the dough, I remember thinking: "Wow, that looks gross." I quickly changed my mind when I tried a slice. The mayo totally works with the pineapple and ham! The recipe here is not the same as the one from Tubby's (which no longer exists) but the trio of pineapple, ham and mayo as the central flavors is. I have to give them credit for that. They didn't invent it, of course, it was just the first time I experienced it. The design of this recipe is the same as previous pizzas. (Check out breakfast pizza – notice the same design format) This is my pizza template. The design has been seen before but the pizza itself is totally different. The use of a template for certain dishes gives a reader familiarity when thumbing through a collection of my recipes. (The grand plan is to take the weekly columns and put them all together in a book). 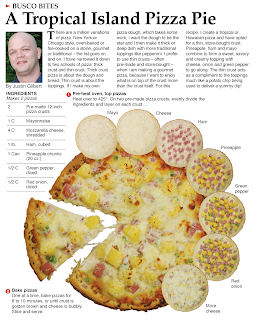 Many graphic artist would frown on me for not reinventing the pizza design each time I featured one. But in a book of recipes, the design will scream "Pizza!" as soon as the reader sees it. I'm still loving my new photo equipment (as I wrote about here). I didn't need to use any photoshop tricks at all to get the smaller pies to rise above the larger finished pie. The photos are so sharp and crisp that they naturally give a rising affect when layered on top one another. This was not the case in my previous pizza efforts. My new photo equipment proves that it's sometimes good to seek out professional help - something I should do more of (at least that's what my girlfriend tells me).